Over the years, we’ve performed at many iconic London locations including Trafalgar Square not less than three times. Our first excursion was as part of The Big Draw event, when we presented a Graffiti Opera workshop under the now famous Fourth Plinth. At our second appearance as part of the London Summer Festival, we had the whole of the sweeping steps to play with, and it was wonderful fun! 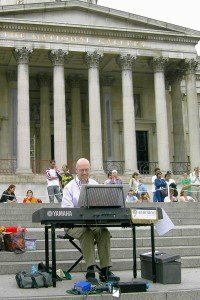 We placed our digital piano on the steps themselves, and equipped with capsule radio mics concealed in our hairline, we entertained the crowd with popular arias and scenes. The sun shone, the Square rapidly became packed with a mix of tourists and Londoners, and they seemed to grow in numbers with every number we sang, so by the end, there was hardly any standing space left. Our third appearance was something really special, a combined performance with two astounding French acrobats performing sixty feet up on single poles, with no safety nets. 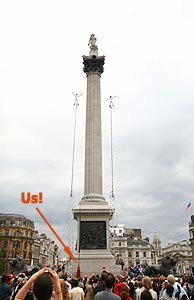 We got the easy job, singing to our specially recorded backing tapes with high quality hand held radio mics, standing next to the lions on Nelson’s column, with the two performers swaying high above our heads. The biggest challenge was to remember to sing and not to watch their mesmerising performance. As they descended to terra firma, the audience suddenly realised the music had been live and not recorded, and went absolutely wild as we sang our last number! Kirsty and soprano Toni were invited to help launch a new Norman Forster office development in Broadgate, London. The piece they wanted was the ‘Flower Duet’, as arranged by modern pop composer and mixmaster Ges-e. So, Indian drums and recorded sounds of the local Brick Lane market blended with Delibes’ orchestration, in a novel and unique fusion of sounds. This was to accompany aerial artists who would perform on giant red ribbons below us as we sang. Kirsty and Toni sang six storeys up on a glass sided platform with radio mics and a fold-back system for the backing track relay, with the crowd in the square below, and the acrobats one storey below us, twisting and turning their way down to earth.